But I digress. What I am remembering is the time I saw Lorna Sass’s pumpkin pie recipe in a Gold Mine Natural Foods catalogue. It didn’t use milk. It didn’t use eggs. 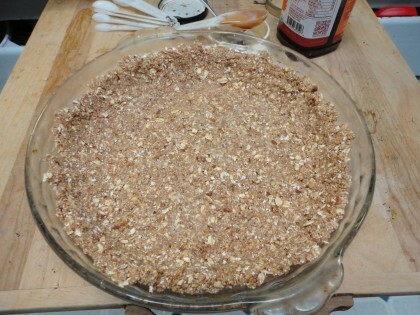 The whole grain crust could be made with all oats and oat flour instead of wheat. So I gave it a try. That pie has worked Thanksgiving magic every year since then with everyone who takes a bite, even the most dedicated omnivores or eaters of the standard American diet. And sometimes at other special occasions. The best compliment I ever received came on one of these. About six years ago, I sheltered a young family of activists who had fled from a fire in faulty wiring that burned the old farmhouse they were renting to the ground. They came for the night, and ended up living with me for about 6 months. A 20 something Mom, a 30 something Dad, the most delightful two year old I will ever know besides my own, and two dogs. The particular group of activists this family was involved with often did the work of feeding people in non-violent civil disobedience actions. I’ll introduce another member of this group, because he is key to my story: a forty-something, taciturn veteran organizer and cook, who mumbled when he talked, and coughed from all the cigarettes he smoked while reading the New York Times, or any other times during the day he had the chance. He’s been active for decades in anti-nuclear and environmental campaigns and was known around the country for his dedicated work. He had been a good friend to Running Girl when she was a teenager who came of age sitting in old growth trees to keep them from being cut down. Since Running Girl used to tease him with this name, we’ll call him Eeyore. Eeyore and Running Girl had birthdays just days apart in October. Running Girl was about to turn 25. Her mother had died when she was 19, and her Dad, though pleasant, lived across the country, and was a bit of a child himself. So no parents would be sending her checks or presents or coming to visit. The fire had burned everything they owned up but half a baby shoe. Being 25 years her elder, I took on the gift of making a vegan birthday “treat.” Because, yes, in those days Running Girl was very much a dyed-in-the-not-wool vegan. And of course I wanted it to be a surprise her taste buds and conscience could enjoy. She had told me a few days before that sometimes she just wanted to go crawl in a hole and hide. And yet she had to finish classes and study for the LSAT, while Amazing Dad took loving care of Magic Boy (which he did unfailingly). So the mood was not the best birthday one. Nevertheless, I felt at least this pumpkin pie might entice. I made it while she was gone to school. And invited Eyeore over for the evening, since seeing him always cheered her up. I put candles on the pie and insisted we sing “happy birthday” to both of them. But I was nervous about Eeyore eating my pie. He isn’t one to trust cooking or baking he hasn’t done himself. He much prefers to be the chef. Since then, the recipe has gotten further makeovers. I no longer use the canola oil in the crust. Instead I use homemade pear sauce. And I no longer use soy milk. Now I use almond. This year I’m toying with subbing the maple syrup out for date syrup, and maybe making some pecan milk to use in the filling. So here it is. A pumpkin pie for those of us who have to be oil free, dairy free, egg free, gluten free, soy free and granulated sugar free. The Free World never tasted so good. Bake at 375 for 10 minutes. Cool on a rack completely before adding the filling. 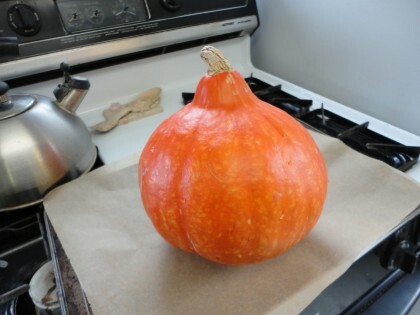 This is the red kuris squash I happened to use this time. Combine the almond milk and arrowroot in the food processor and whir up until combined, about 15 seconds. Add the rest of the ingredients and process until smooth, wiping down the walls with a spatula as needed. Pour into the pie crust. Bake at 375 for 35 minutes, until the outer inch of the filling has set. (The rest will set as it cools if it hasn’t already. Mine has always set while baking, at least son the top, even if it’s very liquid when it goes into the oven.) Cool completely on rack. Chill for at least 3 hours before serving. 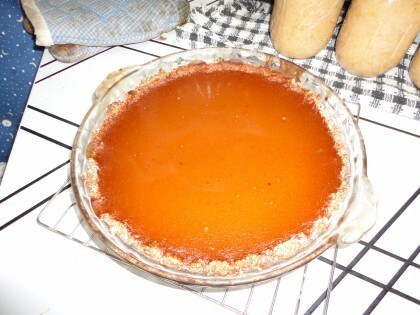 This version is sweetened with date syrup, which cooks the filling up a bit more dark than maple syrup does, and gives a hint of caramel sweetness to the pie. Notes: If you want to venture away from the canned pumpkin puree, the easy way to cook a winter squash for pie filling is to place it whole on a baking sheet (under parchment if you like for easier clean-up), stab it several time with a knife like you would a baked potato, and then bake it whole in the oven at 375 or 400 until it’s soft enough for the rind to dent at the touch of your finger. This takes about an hour, sometimes a little longer, depending on your oven. Then you just let it stand a few minutes, split it in half, scoop out the seeds, then scoop out the flesh into a bowl and puree in batches in your food processor. It freezes quite well. One thing I wouldn’t skimp on in this recipe is the grated fresh ginger. It really makes the spicing sing. Also wonderful if you can grate your nutmeg fresh too. I haven’t tried it yet in this particular recipe, but if you can’t find date syrup ready made (or you can’t afford it, or your inner cheap skate doesn’t want to shell out the coins for it, I know mine doesn’t always), you can make your own by pitting a handful of dates, covering them with water, and letting them simmer for a while on the stove, about half an hour. Pour the whole mixture into a blender and whir it up. The sweetness isn’t quite as concentrated as the commercially made syrup, but it’s very good in many recipes, and probably would be good here, too. I just haven’t gotten around to this version yet. And maple syrup works just great, too. 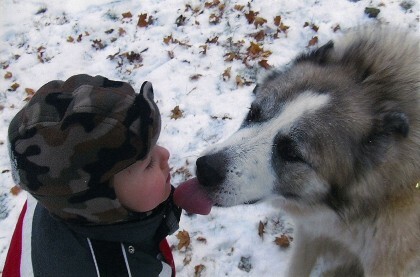 What a lovely story you have shared and i love your photos. The colours of fruits and veges really delight me. In australia we dont have Thanksgiving and pumpkin is mostly made into soup or roasted. I would like to try your pie and the crust really appeals. Thank you Lou! So glad it appeals. You don’t have to be her to celebrate Thanksgiving to try this pie out, or to feel thankful, either! Glad to hear from a friend “down under.” I am keeping well, and hope you are too. Yes, it looks great and I’d love to make it! 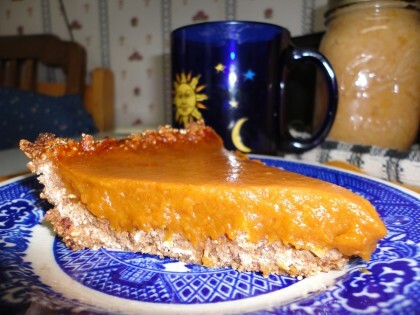 I have made something similar before, because to me the softness and sweetness of pumpkin (or baked sweet potato) are a natural contrast to the wholegrain, nutty crunchiness of the crust and the recipe almost suggests itself. I fell down on the crust though, my family pronouncing it “too like bread”. That was with wholewheat flour, though. Maria, what is arrowroot starch and what is its purpose in the recipe? I may have to substitute for it. And on another topic entirely – but you mentioned it – the matter of mercury poisoning. I may have something similar and am currently undergoing weekly sessions of chelation to try to get it out of the system. I was exposed to a lot of mercury as a child (we actually used to play with it) as well as having a large number of amalgam fillings. I am not sure if “methyl” mercury and straight mercury are the same. But I am interested in how you detoxified from it, if that is what you did …? Arrowroot starch is the thickener for the pie filling. It is lighter than cornstarch, which could also be used, if you can’t find the arrowroot. I supposed you could try potato starch or tapioca starch if you can’t find either of those. The cornstarch would be the best sub, though. In my cursory understanding, the methyl mercury is associated with contaminated fish consumption. The result of eating up high on the food chain. I think the effects are similar, but you would have to check. Truth is, I did not get too attached to “getting it out.” I am a strong believer in Susan Weed’s model of the Wise Woman Tradition of healing. She writes, “In the Wise Woman Tradition, we nourish. We do not fix or cure or balance.” Fixing and curing and balancing are more predominant in other healing traditions, which she calls Heroic and Scientific. She says we all use all of them, of course, but my “ground zero” is the Wise Woman Tradition. Thus, I used only very gentle means of working with this likelihood (I did not have a lab test. This was suggested as a result of palpation during a body work session.) So I did my hands-on holding points homework, and took a flower essence that I felt would help me dissipate heavy metal congestion, and, essential, of course, I stopped eating the fish, which did not make me feel all that well anymore. My practitioner and I decided that chelation would be too harsh for me, as would the process of removing amalgam fillings. I wish you the best in determining whic strategies are right for helping to heal your own body of mercury’s influence. Each of us is unique in this regard. I am also curious, like Jane, about how you dealt with methyl mercury poisoning. How does daffodil flower essence help? Was the manual therapy for the poisoning or for your particular symptoms? Thanks! (See no more only gross leftovers for you. Those relatives will be fighting to taste this pie!!) And yes, Running Girl, Amazing Dad, Magic Boy are all doing well in their different configurations. Homescratch, too, who now lives with Running Girl’s Dad. I recently saw her when she was out west for a brief trip. She said, “I’m not that strict a vegan anymore,” and I said, “Well I am!” And she said “we switched! !” And we both laughed and hugged as if we were back in my kitchen, making dinner together. I also answered Jane about this, so hopefully that answer fills in some more context. Thanks Maria! Yes, between the two replies, it helps a lot. Hi Maria, I really enjoy your stories and I hope to learn from them as well. My boyfriend was diagnosed with MS last year. We have since changed our diets and follow a vegan, no oil diet. If you have any suggestions for books with information regarding what should definitely be avoided in his diet to maintain his health, I would love to know where I can find that good information so as to keep him as healthy as possible. I’m looking forward to trying this recipe for the holidays, thank you for sharing. I hope you have a Happy Holiday! Hi Alisa, thanks for your lovely comment. I think you and your boyfriend are doing a great thing with the way you are eating. I have combed many books for specifics about what I should be paying attention to. The best one, though it is not a strictly vegan resource, is Dr. Swank’s classic, The Multiple Scerosis Diet book, though you have to translate it into no oil or no animal foods. I am hoping at some point to get a bibliography up on a FAQ page here, but I haven’t gotten to that yet. Hopefully soon. Food intolerances are often very individual, so just pay attention to how what you eat affects your digestion, etc. Wheat and soy can be problems for some people, as they are for me, but not others. Dr. Swank cautions against chocolate and coconut, and gives measurements of other high fat foods like olives and avocados and seeds and nuts, so you can stay at 20 grams (or below). I hope you and your boyfriend enjoy the pie. It’s my pleasure to share it with more people. A Happy Holiday to both of you!! Pinning my hopes on this one this year. Hi Mary Kate!! I am so happy you are going to try the pie! I’ve been making it for nearly 17 years in one incarnation or other. Let me know how it goes. Happy Thanksgiving! Hi Mary Kate!! I am so glad to read you are excited about trying out the pie! I hope your hopes will not be disappointed. I’ve been making it in one incarnation or another for nearly 17 years. Enjoy, and Happy Thanksgiving! I follow a similar diet and I just found your blog. Can you tell me how to make the date syrup? I love your blog now I gotta figure out how to sign up. Hi Suzy! So glad to hear you are following a similar diet and that you found my blog. It’s easy to sign up for. To the right of the post at the top there are two options to click on. One for RSS and one for being notified by e-mail. Just click and follow the steps. If you have questions or troubles, let me know at moonwatcher@fatfreevegan.com. The date syrup I used in the pie is commercially made, a brand my co-oop carries called Date Lady. It’s expensive, but I don’t use a lot all the time so I splurge. I have also made it myself with whole medjool dates according to a recipe Chef AJ has in her book Unprocessed. The basic method is to simmer dates covered in water for about 30 minutes, then let cool at bit, then pour into a blender and blend. This makes something more like paste, but it keeps a long time in the fridge. I haven’t tried it in the pie, but I have used it in other recipes. Straightupfood blog http://www.straightupfood.com/blog/2010/05/04/orange-berry-muffins/ uses it in all her dessert recipes to good effect. Hope this helps, and welcome aboard!! Maria, can u go into more specifics about your daily diet? Luke u, I’msstruggling with similar issues and would love to see a sample days diet. Your story is very inspiring. Do u have a blog? No thanksgiving here either but I think I am often thankful for this or that throughout the whole year so do you think that is a wonderful excuse for eating it as a happy pie? I love those changes, plenty of ideas there. How are those people now? I hope they fare well. Life can be so filled with unhappiness, problems and loss and I know many get bogged down, I do. I push on as they seem to, as you do I think. We rise up and above it and even if we cannot stay there all the time it is good to know we reach it and life looks so different from all the perspectives, doesn’t it? Many flocks of birds were resting in various copses on the land yesterday and they flew up and away… So late this year I thought. I have so enjoyed the ones that settle here and sing and come to the door and run and jump in the kitchen until I have given them their food. They will receive a joyous welcome in the spring on return home. about the Gravel.” Thank you for all your thoughtful comments! And many blessings in the new year. Bit of a time later, but, you are back! Well I hope? I have been off the boil…. And still up and down, the cold and dark not suiting just now. A lovely bright and shining pie is just right. You know the little things contain the wonders of life and I read that in your words each time for I hear your looking and, actually seeing. A rare gift. I decorate with colours too, I sprinkle so many pumpkin seeds just now for things that taste so good and heat me up are brown and oatmeal coloured so need an inviting touch as we all eat with our eyes first don’t we? I love a sprinkle of golden turmeric too and whitish ring of sesame seeds. How are your sunsets just now? Ours are so pink and gold and the empty branches look very beautiful as black branches arrange themselves in front and so many paintings are bubbling around in my head to ensure I remember the beauty during the cold and wet and being stuck in for weeks on end. Have you arranged your Poetry titles and got much happening in that line at all? I know you moved and seemed happy and had relatives by you too. How lovely. Love in the house. I shall have a wander about whilst the wi fi works as things have been wildly on and off (storms for weeks) and so some things in and others coming in at a mad rate so I am being a slowmo and just popping in and out myself. Lovely daal with many vegetables has worked wonders today and feeling very warmed and cheery. My chia jam looking very red and really tastes good (strawberries and raspberries). More colour too, very pleased. Thank you for the updates, Airyfairycelt! We had a pink-gold sunset here tonight too! Lovely. Glad you are making colorful healthy food to keep you cozy through the storms. Not much poetry writing these days, but lots of drawing with the pastels. Enjoy those sunsets! Sorry about that Barbara–I’ve never thought of it as a deep dish, but I guess it is. I hope you were able to fill it up enough! Thanksgiving blessings to you and yours.